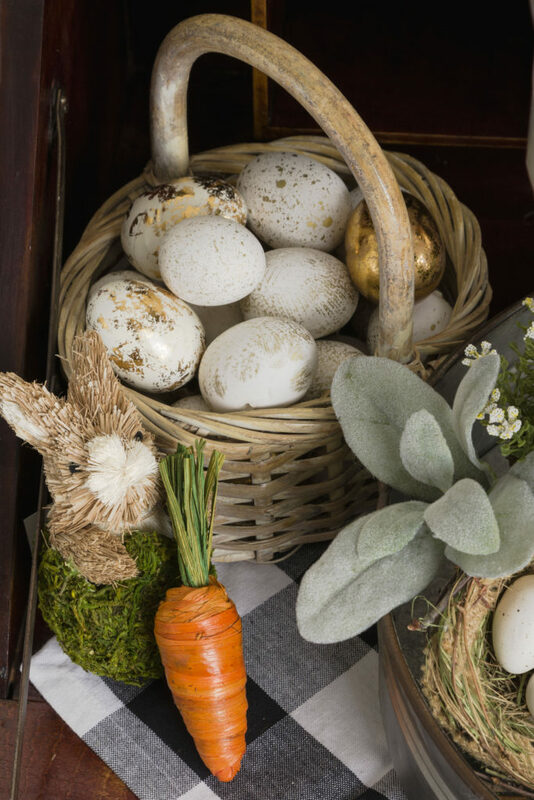 I started this easy Easter decorating vignette when I realized something was missing. 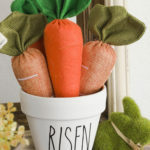 I was really enjoying the fun decorations I had already made, but I really wanted something that spoke to the real reason for Easter. 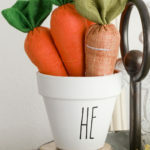 Don’t get me wrong I enjoy bunnies and bright colored eggs too, but adding the He Is Risen flower pots that I painted and added the vinyl letters I cut using the file I purchased from Etsy was just what I needed. I added a white cross to the display, and then I added the clay flower pot on it’s side as a representation of the tomb. The sweet lamb was a gift and he was perfect for this vignette. 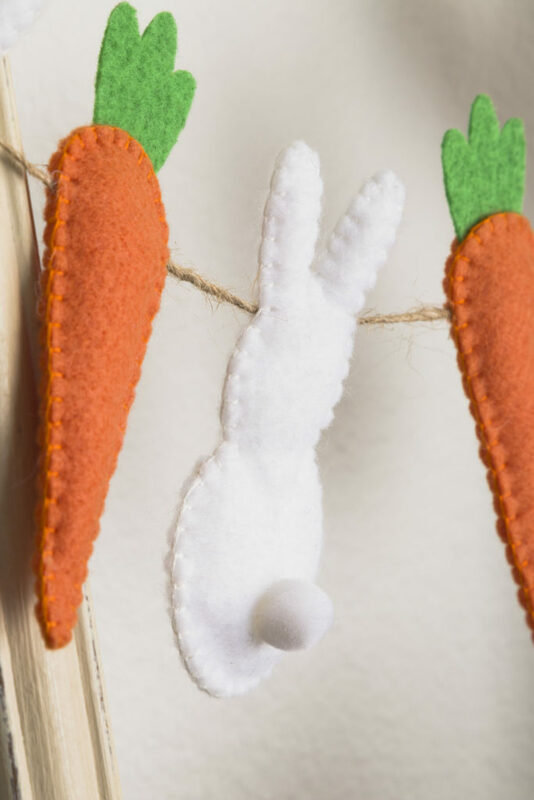 The cute bunny and carrot banner that is hung on the brown vintage frame was another Etsy find. I removed the tiered tray so I could get a photo of the three pots together. An idea I have is to order three more words for the other side of the pots so I could use them anytime. The buffalo check napkin I used to add some interest and to protect the antique secretary from scratches. The black and white is repeated in the Rae Dunn inspired font on the flower pots I painted white. I like to mix some rustic elements in such as the tree slices to add some warmth and height to the overall vignette. Would you like more spring inspiration? Check it out HERE and you are on your way. This view gives you a closeup of each flower pot. They really look like the “real” thing. The basket of eggs I added in since they represent a new beginning. The eggs I removed from a closeout wreath I purchase at Joann’s about three years ago. 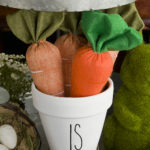 The bunny and carrot banner SVG files I purchased from Etsy and I cut them out and blanket stitched them together. I am really happy with how it turned out. You can use the files to make the cuts on a Cricut machine in either paper or fabric. 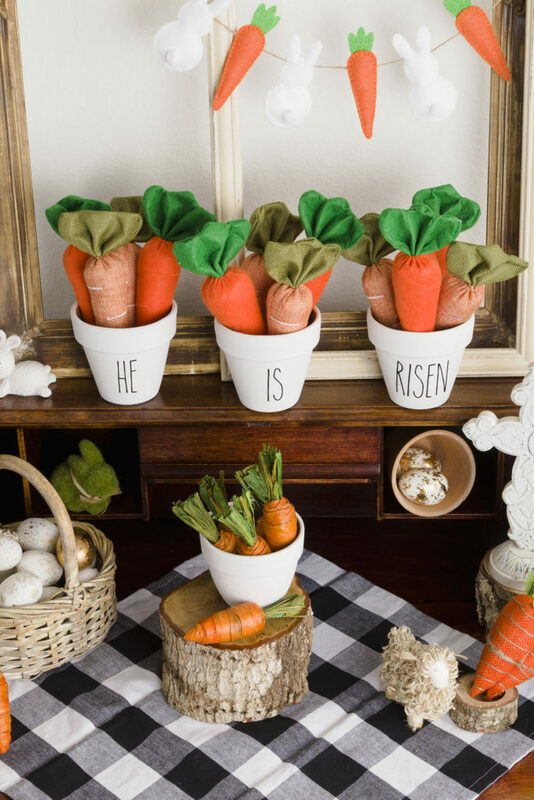 Easy Easter decorating using items you have on hand, crafting a few and just a tiny Etsy purchase. I am working on one of my biggest projects ever and I would love for you to join me as I show you how to do a custom room makeover DIY. Hint: It is my daughter’s room and it is going to be Boho romantic chic. Thank you so much for hopping by for a visit. Please say hello in the comments below. It really makes my day to hear from my readers. I am in love with those pots! Happy Easter! 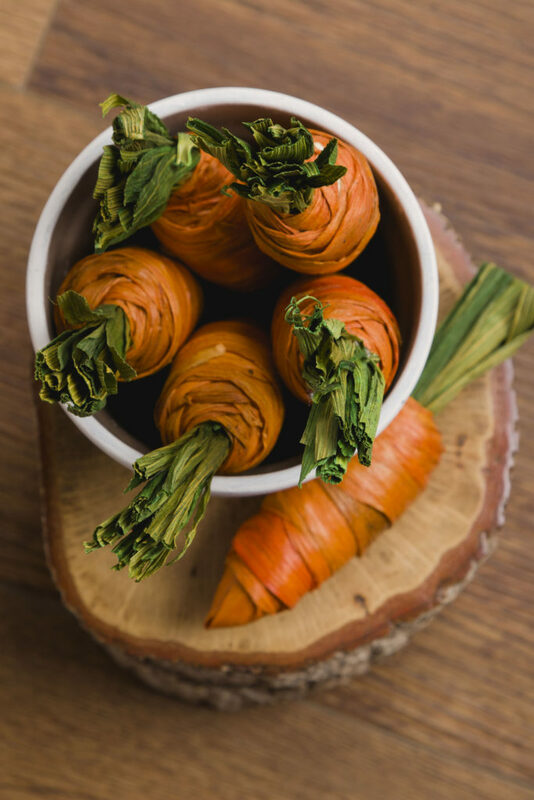 So pretty, Kimberly… and I love those carrots inside the pots. Did you make those? 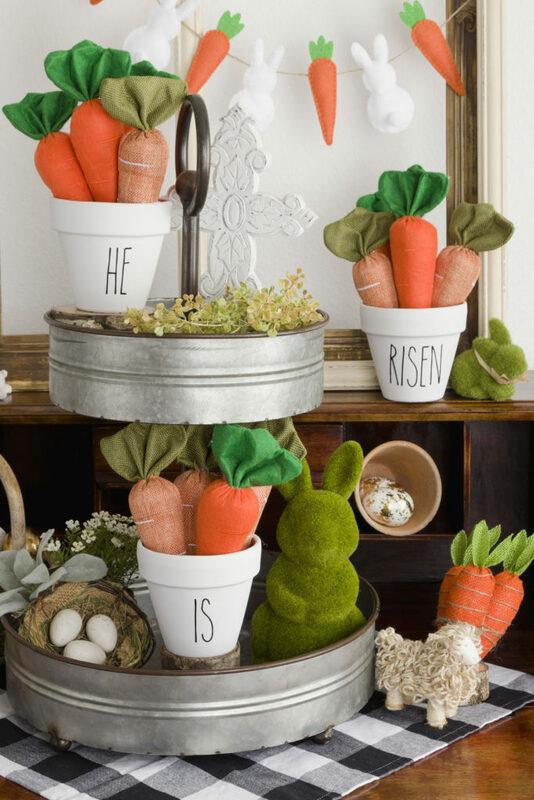 Oh, and I LOVE the way that you added elements of the true meaning of Easter! He is risen indeed! So cute! 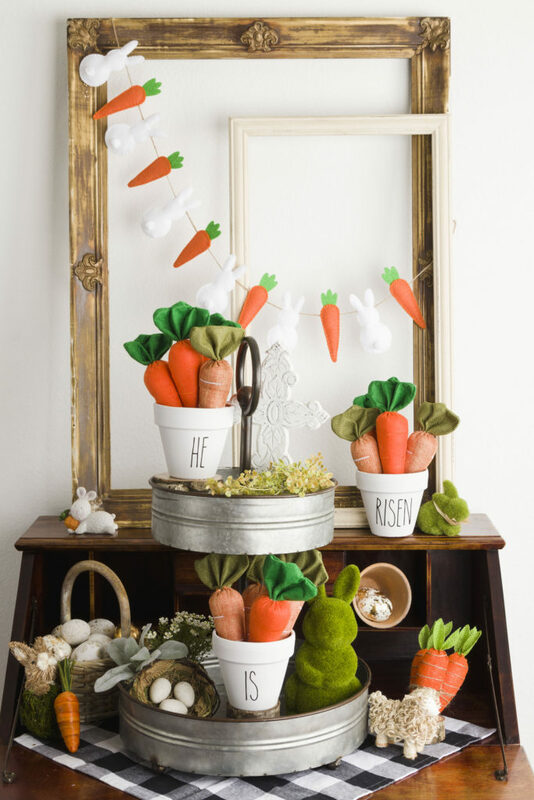 I wish I gave myself more time to make cute Easter decor this year. Saving this for the future!